PRICES ARE ACTUALIZED BY THE RUBLE COURSE on May 24, 2015 (0.45 CPC). PRICES MAY CHANGE. RESERVE AT BOOKING. 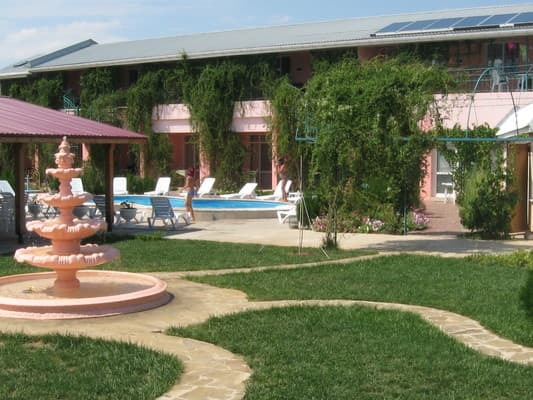 Pension "Grinvich" is located in an ecologically clean corner of the Crimea, in the countryside of the city of Evpatoria (town. Zaozernoe). Territorially the boarding house is located behind the Moinaki lake in 15 minutes walk to the sea and a well-maintained beach. 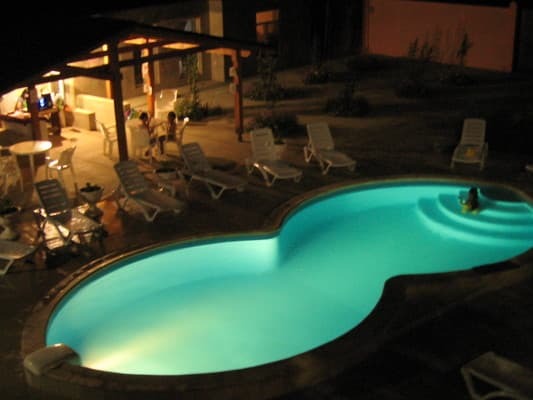 The hotel building consists of a two-story building, located on its own enclosed territory. Rooms in the hotel "Grinvich" - one-room, equipped with everything necessary for a comfortable stay. For the convenience of guests coming to Crimea by car, there is a free car park. Wi-Fi is available. Near the hotel there is a bus stop and the National Paralympic Center is located, where you can visit the gym, swimming pool, play tennis, badminton. Description of the room: One room with a large balcony. Furniture: 2 single beds (orthopedic mattresses), cosmetic table, cabinets, curbstones, coffee table, chair-bed, computer table, as well as a large kitchen area with a hood. Cold and hot water is served around the clock. Change of linen 1 time in 5 days. Description of the room: Comfort room is a two-room suite, which is located on the 2nd floor. The entrance to the room goes through a small corridor, from which the entrance to the first room and a bathroom. There is a closet, a refrigerator and a microwave in the corridor. The bathroom has a hygienic shower and an ordinary shower. 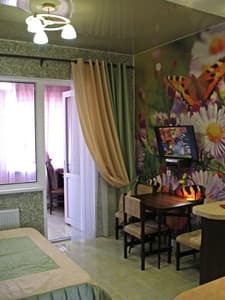 In the first room there is a large double bed, bedside tables, lamps, a wardrobe, a TV with a large LCD screen, air conditioning. And also a kitchen area: a kitchen wall with an extract, a multivarka, a two-burner electric stove, an electric kettle, a washing machine, a dining table, chairs. There are all necessary utensils for cooking. In the second room there is a comfortable folding sofa, a desk with a mirror for ladies, a hairdryer. Guests are provided with thin summer blankets, three towels per bed. The complex accommodation service includes room service, daily room cleaning, change of linen every 5 days, as well as use of children's playground, children's room, outdoor pool, chess, drafts and other games, Wi-Fi throughout the hotel. 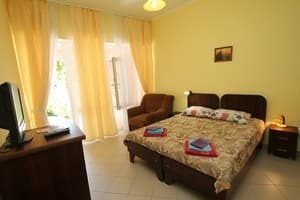 Description of the room: Studio room is a two-room suite, where one room is a spacious bedroom, the second room is a full kitchen. The room is on the 2nd floor. 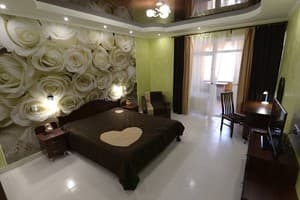 In the bedroom there is a large double bed, a mirrored wardrobe, a TV with a large LCD screen, a desk with a mirror for ladies, a chair-bed, air conditioning and a romantic mood. In the kitchen: a kitchen wall with hood, built-in electric cooker, washing machine, microwave, refrigerator, electric kettle, dining table and a folding 2-bedroom sofa. There are all necessary utensils for cooking. The entrance to the room goes through a small corridor, from which the entrance to the bedroom and a bathroom. The bathroom has a hygienic shower and an ordinary shower. Guests are provided with thin summer blankets, three towels per bed. The complex accommodation service includes room service, daily room cleaning, change of linen every 5 days, as well as use of children's playground, children's room, outdoor pool, chess, drafts and other games, Wi-Fi throughout the hotel. 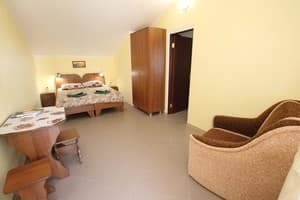 Description of the room: Single rooms with an area of ​​8 sq.m with a large balcony. In the room: 2 single beds (orthopedic mattresses), cosmetic table, cabinets, curbstones, coffee table, chair-bed. Cold and hot water is served around the clock. Change of linen 1 time in 5 days. Description of the room: Cozy and spacious two-room suite. One room contains two single beds, the second - a comfortable sofa, there is a desk. Also in the room there is a sofa-chair, the maximum number of people is 5 people. Children under 6 years without a seat are accommodated free of charge. All rooms are equipped with extra beds (armchair-bed). The cost of additional. Places from 16.06 to 15.09 - 100 UAH, in the rest of the period - 80 UAH. 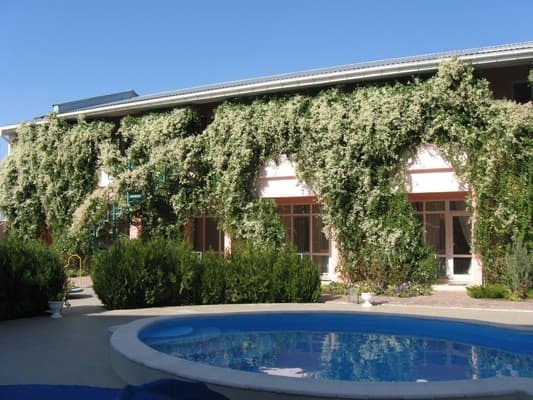 Pension "Grinvich" is located in an ecologically clean corner of the Crimea, in the suburban area of ​​Evpatoria (village Zaozernoye). Territorially the boarding house is located behind the lake Moinaki. To the sea and a well-maintained beach 15 min walk. To Evpatoria, then from the railway station by shuttle bus № 119 to the stop "Paralympic Center".